Haircuts and the Spectrum - Caboodle - We fight conditions & disorders through knowledge & community. We fight conditions & disorders through knowledge & community. 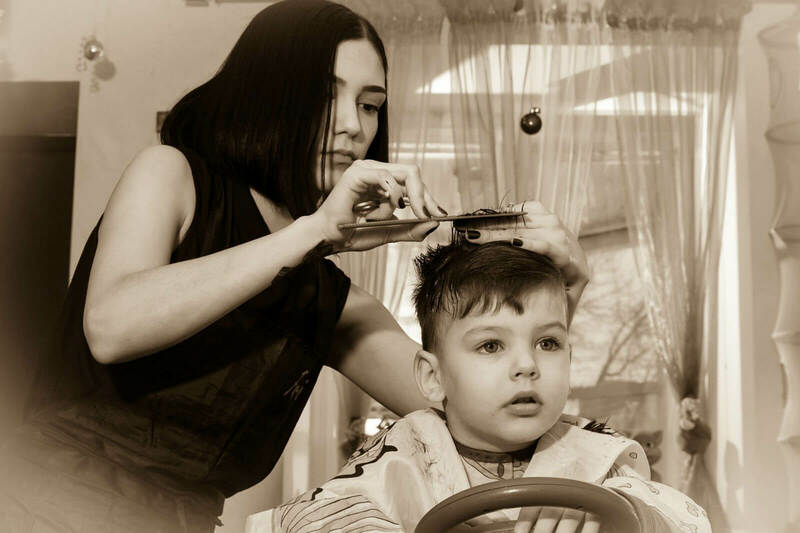 Haircuts are a unique challenge for our loved ones on the spectrum, which often makes it a daunting and dreaded task for the caregiver. In our house, the haircuts are doled out by our loving and patient, Grammie, who just so happens to be a talented hair-stylist by trade. The haircuts can take up to three days to complete but we are slowly closing that gap with lots of prep work, encouragement, communication and practice. As far as haircuts go, we are quite blessed and I’ve often wondered what other caregivers do who don’t have a “Grammie” as a of resource. Michael, a young man with autism, developed a bond with a barber, Freddy, after several less than successful attempts with others. 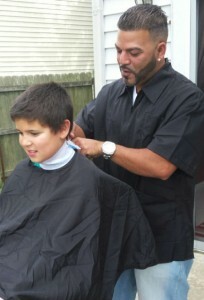 Having Freddy cut Michael’s hair made life much easier for Michael and the Flores family. When the Flores family had to move to another state, eight hours away, Freddy made a promise that even Mrs. Flores didn’t think he could keep. She was simply grateful at the gesture that Freddy would make the trip to Virginia to cut Michael’s hair. Sometimes people say things they will do, as a kind gesture. Even if they never follow through, the fact that they offered is a lot to be thankful for. Freddy DID follow through. Freddy and his wife, Chaquira, made the trip from New Jersey to fulfill the promise he made to us. This was after he worked in his shop all day, until 8:30pm. They left New Jersey at 9:30pm. They drove all night and arrived here, in Virginia, at 5:00am. They slept for a few hours and then he texted me saying he would be here when I wanted, because his day was dedicated to us. When they got here, Jason gave them a tour of our new home. Then, Freddy got down to business. Even though the venue changed and he was cutting Michael’s hair in my backyard, nothing else changed. There were lots of laughs. Michael made sure to remind Freddy to not cut his ears off. That is a reminder Freddy gets every time from Michael, from day one. And he sat, as he has from their first meeting and let Freddy cut his hair. Autism Speaks has partnered with Snip-Its and Mellark New England to create a haircutting training guide and video for stylist and families. Hair Salons and stylists can also register on the Autism Speaks website to offer your services to those with autism in your area.